Guillermo del Toro To Make His Debut as Animated Feature Director at Netflix! Guillermo del Toro has signed on to direct, write and produce a musical take on Pinocchio for Netflix. The passion project will be his debut as director of a feature length stop motion animation. The Jim Henson Company Renews Licensing Agreements With BOOM! Studios! The quality of its award-winning, bestselling titles for classic brands like The Dark Crystal, Labyrinth, Fraggle Rock and The Storyteller have earned BOOM! Studios renewed licensing agreement for those brands by The Jim Henson Company. More Dark Crystal? Yes, Please! Netflix Orders Prequel! The Netflix oOiginal Series ‘The Dark Crystal: Age of Resistance’ is coming soon. The teaser does its job beautifully. I’m stoked! Cable Channel for ‘Millennials’ Coming Next Summer! If you’re between 18-34, and feel like you’re being ignored by the media, an as yet unnamed cable network is planned to provide viewers in your demographic with ‘Entertainment That Matters For Viewers 18-34.’ The network is being launched by Participant Media (An Inconvenient Truth, Promised Land) and is a cooperative effort that is supported by The Jim Henson Company, Meghan McCain, Morgan Spurlock, Mary Harron, Gotham Chopra, Timothy Scott Bogart, and Cineflix Media, among others. Curious? Check out the official press release following the jump. This Just In! Farscape: The Complete Series Goes Blu-ray! Great news, Farscapers! 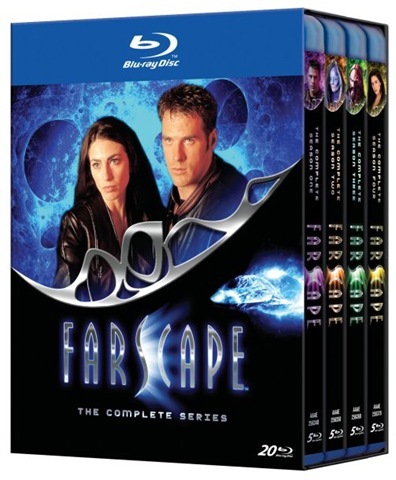 A&E Networks Home Entertainment and The Jim Henson company have just announced that Farscape: The Complete Series will be released on November 15, 2011, with a list price of $199.99 US. The blu-ray release will feature, in addition to the array of bonus material on the DVD, a new documentary, Memories of Moya: An Epic Journey – featuring revealing new interviews with the cast and creators. Individual seasons will also be released in Blu-ray sets.